The results of the contest were announced on March 12 and best extensions according to the jury, which included J. J. Garrett, the inventor of the term Ajax, are provided below. Most of these extensions (those winning at least) were here for a long time, so congratulations from the organizers to candidates to have provided the software on time seem rather superfluous. 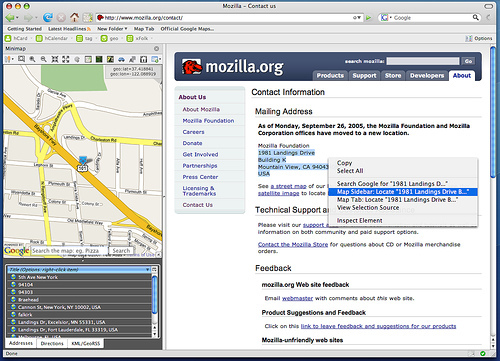 This extension adds a map in the sidebar. 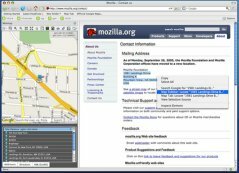 This map will synchronize with the addresses found in web pages. It is a messaging software that integrates with Firefox, whose goal is to centralize in the browser all services. Used to transmit to bookmark sites or emails URLs of the pages you visit. Allows you to switch from one page to another among all documents in memory, from the sidebar. Adds new features to bookmarks. Search Tool for bookmarked site on the del.icio.us. Turns movements of the mouse into commands. Place a table in the clipboard retaining formatting. Alternative to RSS for website where feed are missing and informs of updates on these sites. Corrects URLs' extensions (TLD) when they are improperly typed in the bar. The extensions I use daily, are not in the list of winners, for this edition, but they are in the list of essential extensions for webmasters. © 2008 Xul.fr - All rights reserved.